Most of the energy used in the home is to heat it. In the UK, an average of around 60 per cent of energy is spent on space heating, but in homes with radiators simple steps can be taken to cut bills and reduce carbon dioxide emissions that harm the environment. Thermostatic radiator valves can sense the air temperature around them and switch the radiator on and off accordingly. They control the flow of hot water into the radiator, so as the room warms to a preset temperature, the valve will gradually close reducing the amount of heat given out. Conversely, as the room cools, the valve opens to allow more hot water in to the radiator so that it can give out more heat. Fitting thermostatic radiator valves throughout the home allows accurate control over the temperature in each room. This can save considerable amounts of energy and reduce bills by preventing some rooms from overheating. The valves are relatively cheap, starting at under £10 each, and are simple for a plumber to fit, so the cost is quickly recouped. Thermostatic radiator valves can’t turn off the boiler when the whole house is warm, so to get the best out of the valves they should be used in conjunction with other heating controls, namely a programmer and a room thermostat. Programmers allow the central heating and hot water to be switched on and off at different times throughout the day to suit the home’s needs, while a room thermostat senses the air temperature of the home and simply turns the heating on and off in order to keep the temperature at a set level. Both these jobs can be done by one device called a programmable room thermostat, which sets when the heating comes on and what temperature it reaches when it is on. It means different temperatures can be set for various times of the day and days of the week, saving energy and money. The radiator in the same room as the room thermostat should not have a thermostatic radiator valve. If it does, keep the valve on the maximum setting and adjust the room thermostat accordingly. It is important that thermostatic radiator valves, programmable thermostats and room thermostats have a free flow of air to allow them to sense the temperature, so they must not be covered or blocked by furniture or curtains. Also, try not to place wall or table lamps, televisions or electric fires close to these devices, as it may prevent them from working properly. For homes with a hot water cylinder, a cylinder thermostat is another worthwhile addition. It can switch the heat supply from the boiler to the hot-water cylinder on and off by sensing the temperature of the water inside the cylinder. More advanced controls, like boiler energy managers, are also available. 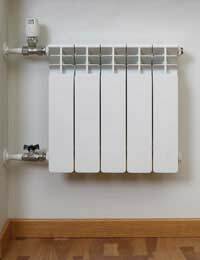 Reflective radiator panels are very cheap – as little as £2 each – and can pay for themselves within six months. They reflect heat that would otherwise be lost through the wall back into the room. The panels are easy to install too. They just slot behind radiator wall panels, are cut to fit and stuck in place. Whatever energy saving measures are taken to cut back on heating bills, it is always worth remembering that turning down the thermostat by just one degree Celsius can save up to 10 per cent.